It’s generally agreed that we let Mike Duff go to Burnley in 2004 virtually for a ‘friendly and a packet of pork scratchings’. In retrospect, considering he wanted to go and maybe we owed SC a favour, was that a fair price? However - what price now!? What, for a bag of pork scratchings? I’ve no idea ... never eat the stuff. It was £30,000 and a pre-season friendly and in my view, a fair deal for everyone at the time. He was out of contract and clearly wanted to go/was capable of playing much higher. The amazing thing was that he didn't leave Cheltenham earlier. Yes, despite my jesting on the subject (apologies), that’s an interesting take from JP. I wasn’t aware Mike Duff was out of contract at the time. People have generally remarked (even Burnley fans) that Mike Duff was probably the Football bargain of the decade, but when you compare his success at Burnley, compared to say, Mo Eisa going to Bristol City, it shows that any form of impact/success is not a given. 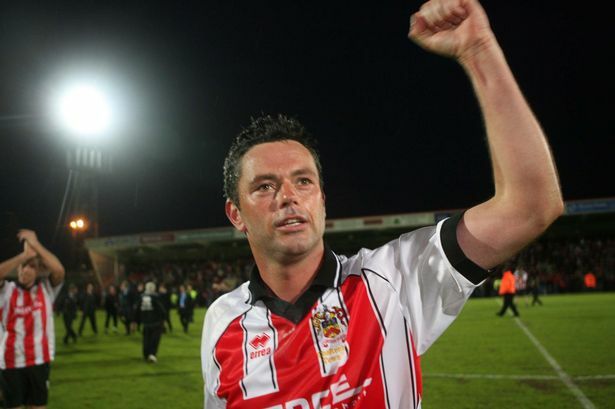 Despite the fact Mike Duff was destined for greater success and probably wanted to move on, he always willingly gave his time to youth football in Cheltenham and often presented end of season awards at local youth football clubs (as did his brother Shane, and Grant McCann, that I knew of). He had a year left on his deal and was refusing to sign a new one. The plot thickens. If that’s the case, then the £30k Burnley paid was the biggest heist since the Brink’s-Mat robbery of 1983. That heist was worth £26M. A similar ‘what price now’ value to what Mike Duff would be worth (imho), in answer to milestones opening question. Not at all. If he was refusing to sign a new contract then we were right to get something out of it, else we would have received nothing at the end of the season. You are probably right, but the surprising thing about that being no one else made a better offer? Was he even on anyone else’s radar? If it was only Burnley, they must have been licking their lips when they got him on their training ground and realised what he could become. The boy done good, and he’s doing good again for us. Enjoy him whilst we’ve got him because history will likely repeat itself and he could again be destined for greater things one day. He made it clear that he was only interested in signing for Burnley, I believe. Depends. Always the chance that through staying one more season we could achieved success which earned us more than the transfer fee did. But you really think having this one player for one more season would’ve been the main reason for us getting promoted? There was a 15 per cent sell-on clause in the deal and the friendly generated around £20,000 for Cheltenham too. Duff was 26 at the time and would have walked away on a free the following summer. It would have been outrageous, after what he'd done for the club, to block the move to a Championship club. I don’t think that, no. Just said there was always the chance. We got a reasonable deal for a player unproven at a higher level. Turned out he was quite good and coped with the step up. Could have gone the other way. As always hindsight is a wonderful thing. He is worth a considerable amount more now if any club wants to buy out his contract ?